13 new hotels in the pipeline for the Lower East Side, tripling the number of hotel rooms in the neighborhood over the next few years. Four new hotels are scheduled to open, boosting the existing inventory by approximately 30 percent. Six other projects in various stages of construction and four of which are on a two-block strip along upper Orchard Street will add another 900 rooms. 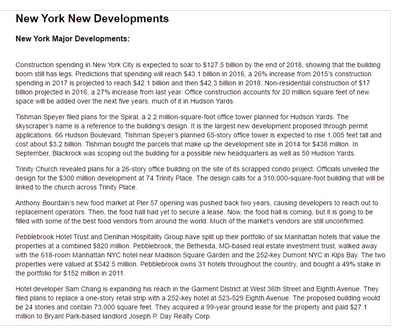 And three other recent proposals, a 130-room boutique hotel in the landmarked Jarmulowsky Bank building on Canal Street, a 376 room hotel/condo combination building on Chrystie Street and a Broome Street project are currently seeking regulatory approval. A group of federal policies are set to take effect in January that will cut federal spending and end some of the Bush-era tax cuts. But the so-called fiscal cliff will have different effects on commercial real estate values across the country. 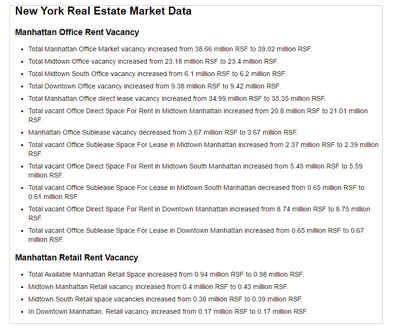 In New York City, the real estate sector is about to take a big hit. 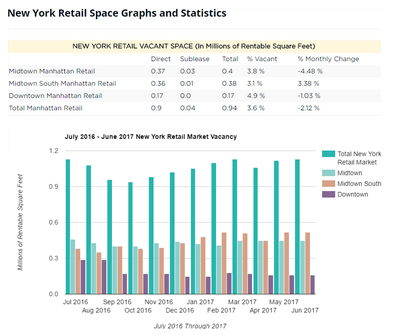 One prediction is that every commercial real estate sector will see some decline, but the hardest hit will be office and industrial, hurt by declining government and consumer spending. 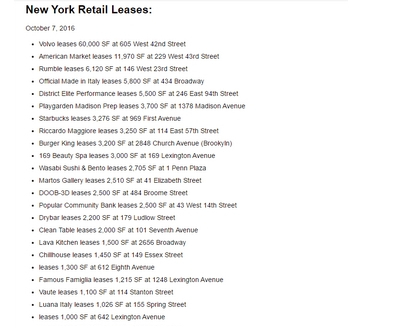 The Empire State Building’s list of tenants has been reduced to 171 companies, down from more than 600 in 2006. Average rent has climbed to $42.10 per square foot, from roughly $26. Many believed that the long-delayed Jean Nouvel-designed 1,050-foot MoMA Tower was nearing construction, however the project is still in its financing phase. They have yet to secure the financing necessary to begin building. 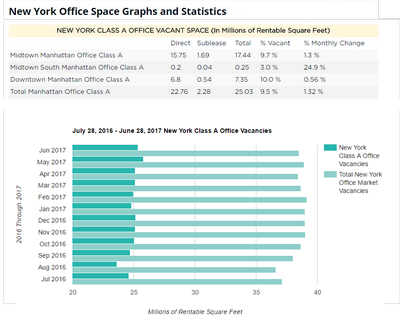 As New York’s quickly expanding tech sector obtains increasingly more prime office space, much of the focus on tech real estate has been on what kind of office space those companies are taking. Some of New York’s most savvy and powerful tech personalities are renting in Downtown and Brooklyn neighborhoods. Spurred by the strength of the yen, Japanese billionaire Akira Mori is planning a 100 billion yen to $1.2 billion prime real estate shopping spree in major world markets, including New York, London and Tokyo. The plan represents the first investment of this scale by Mori since 2008. The Mori Trust Co. is looking for office towers, and developments that are energy efficient, equipped with disaster-prevention systems and able to hold value through market downturns. 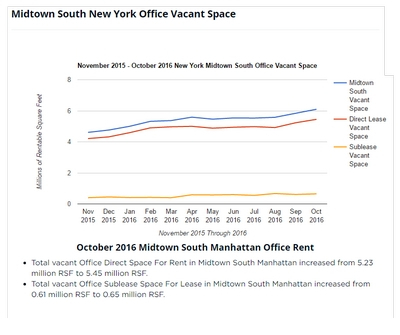 New York offers this type of investment opportunity. There is a plan to rezone Midtown East and fuel new development in the area. Three Midtown East houses of worship – St. Patrick’s Cathedral, St. Bartholomew’s Church and Central Synagogue — want to sell around 2 million square feet of air space above their landmarked buildings, a commodity that could be worth nearly $400 million. The houses of worship are hoping that the city will grant them the same flexibility regarding air rights that it is granting itself under the rezoning plan. The owners argue that they are desperate for a capital injection. Vornado Realty Trust received a $120 million refinancing of a Union Square retail property. 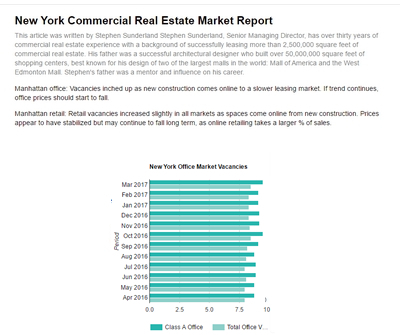 The real estate investment trust obtained a seven-year loan on 4 Union Square South, at 40 East 14th Street, netting $42 million. The 206,000-square-foot property is fully occupied, and tenants include shoe retailer DSW, clothing company Forever21 and Whole Foods Market. The nearly completed Fulton Street Transit Center, officially known as the Fulton Center, promises to be one of the most imposing new buildings to arise in Manhattan in over a generation. The same, cannot be said of 180 Broadway, a Pace University dormitory that is approaching completion just across from it at the corner of John Street. Two New Yorkers have sued the Metropolitan Museum of Art, claiming the cultural institution violated its lease obligations through fraudulent admission fee practices. The Met’s perpetual lease agreement allows the museum to occupy several acres of Central Park along Fifth Avenue from 79th to 85th streets rent-free, as long as it admits the public for free on several days each week. The plaintiffs estimate the deal has saved the museum $368 million per year, and a total of $9.4 billion over the last 42 years. The City Council voted unanimously to approve the rezoning of Chelsea Market, paving the way for developer Jamestown Properties to build a nine-story office tower atop the converted cookie factory. Jamestown had made several concessions to city planning officials and opponents of the project, nixing a plan to build a hotel and earmarking money for affordable housing. Vornado Realty Trust has obtained a $950 million refinance of the 43-story, 2 million-square-foot office tower at 1290 Sixth Avenue. Vornado had announcement that it would upgrade the building, including a new turnstile system, updated restrooms and a refurbished cooling tower. Vornado has a 70 percent controlling interest in the property, where tenants include Cushman & Wakefield, Wenner Media and Microsoft. 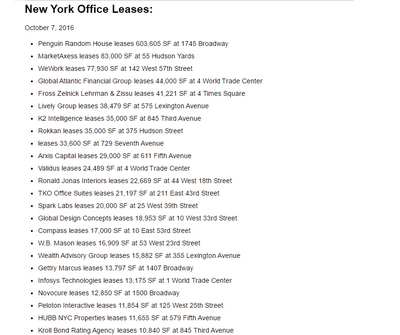 The Lightstone Group has donated 11,309 square feet of office space at 1407 Broadway to businesses ravaged by Hurricane Sandy. The effort comes as part of a city program. Lightstone joined forces with the city Economic Development Corporation to help these businesses get back to work. There has been so much devastation throughout New York City since Hurricane Sandy. Following a $10 million, 16-month renovation, nearly a decade of planning, and delays caused by Hurricane Sandy, Soho’s Drawing Center, the only museum in the U.S. devoted to drawing, is about to open. The museum, which has been located at 35 Wooster Street since 1986, has bought and incorporated the building’s second floor, adding some 1,500 square feet of gallery space for a total of 4,500 square feet of exhibition space. It will now be able to handle five exhibitions a year. 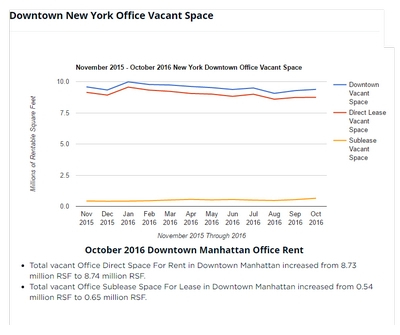 Large tenants have retreated by the amount of available office space piling up on a stretch of Sixth Avenue that is home to many of the city’s premier office addresses. 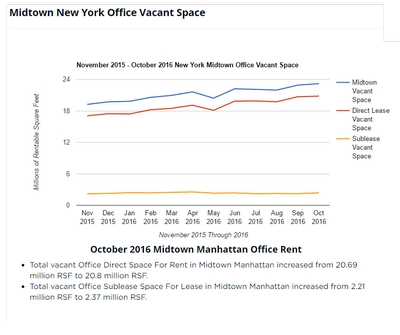 Last month, Manhattan landlords and tenants listed another 384,000 square feet in six buildings located between 41st and 55th streets on Sixth Avenue. Skidmore, Owings and Merrill’s New School University Center at 65 Fifth Avenue is nearing completion. A svelte sliver of pale brick with limestone detailing, it could hardly be more emphatically different from the dark and brutish one across the street. Rising to 10 stories, it is built for commercial use at street level, while the upper floors contain four units, three duplexes and one triplex. Each of these condominiums will occupy the entirety of its floor plate. The latest in the never-ending scheme of renaming New York City’s neighborhoods, for fun or profit, has the Times Square South area going by “Chelsea North”. The Times Square South area, between West 42nd and West 35th streets and Ninth and Sixth Avenues, has had an identity crisis of sorts, at times going by the “Garment District.” But that neighborhood is more properly located further east, and the name does not accurately describe the tenant base. The leases on eleven former Daffy’s stores will hit the auction block in December. Five of the stores are in Manhattan, one is in Queens, one is in the Bronx and three are in New Jersey. Daffy’s announced this past summer the closing of all its locations as part of the company liquidation. 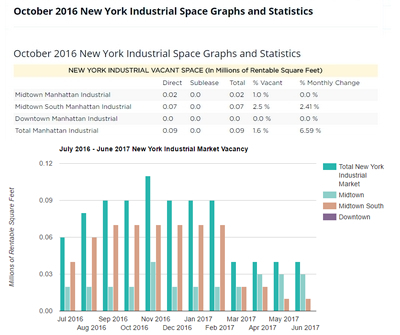 Brooklyn new development sales are rising as the median price per square foot hitting a historic high. 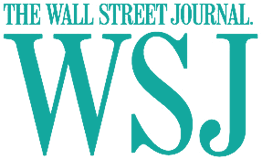 In the third quarter, total sales volume rose 31 percent over the previous quarter, to a total of $307 million from $232 million. The median sales price rose 11 percent to $687,318 compared to the previous quarter, and the median price per square foot increased 5 percent, to $723 from $690, in the same period. The owners of the Empire State Building have inked a $55 million settlement with a group of investors who challenged their plan to create a real estate investment trust that would include the iconic Midtown office tower. 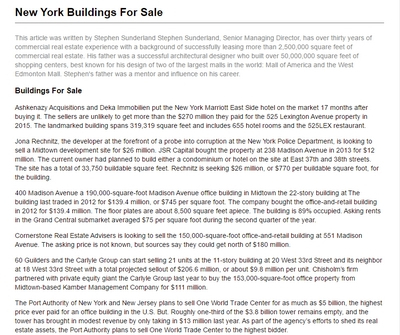 Malkin Holdings and the estate of Leona Helmsley announced plans to raise up to $1 billion through a REIT that would include the Empire State Building and 11 additional properties in New York and Connecticut. Shortly after, investor Leon Meyers sued to block the plan, and a handful of other lawsuits followed. As Ralph Lauren does away with its Rugby brand, two of its locations located in popular downtown spots could soon hit the market. One of the locations is a 2,500-square-foot store at 99 University Place, south of Union Square; the other is 1,000 square feet, and is located at 390 Bleecker Street in the West Village. These stores, along with the brand’s other spaces around the world, will close by Feb. 2. Billionaire Ty Warner, the Beanie Babies tycoon, has received a $900 million offer for his Four Seasons Hotel New York, possibly from an unidentified Asian investor. Warner purchased the 368-room hotel, located at East 57th Street, for $275 million in 1999. If Warner accepts the offer, equivalent to about $2.4 million per room, it would be one of the priciest hotel sales ever in Manhattan. Four Seasons Hotels and Resort must now decide if it is prepared to match the offer in order to keep the flagship location. The Chicago-based architect Jeanne Gang is to make her New York debut with the 180,000-square-foot office tower on 10th Avenue between 13th and 14th streets. The project, which is to be developed by William Gottlieb Real Estate, will rise on a site that currently houses a vacant meatpacking plant. It is expected to be completed by 2015.The office tower is designed to block as little light and views from the High Line as possible. Coatue Management, an investment firm, is tripling its 10,000-square-foot lease at 9 West 57th Street. The 10-year deal will result in Coatue taking the entire 25th floor, nearly 31,000 square feet, at approximately $120 per square foot in the black-glass Plaza District tower. The firm had been subleasing its space from a private equity firm, which has another space in the nearly 2 million-square-foot building.